Triumph's Speed Triple 1050 is one factory Streetfighter than delivers the goods. It's plenty fast enough, in fact you can hit 150mph if you can hang on. Plus it sounds beautiful and the fact that it's a big heavy lump that needs manhandling round corners actually attracts devotees. The Speed Triple always was, and remains, a bit of a Rottweiler. 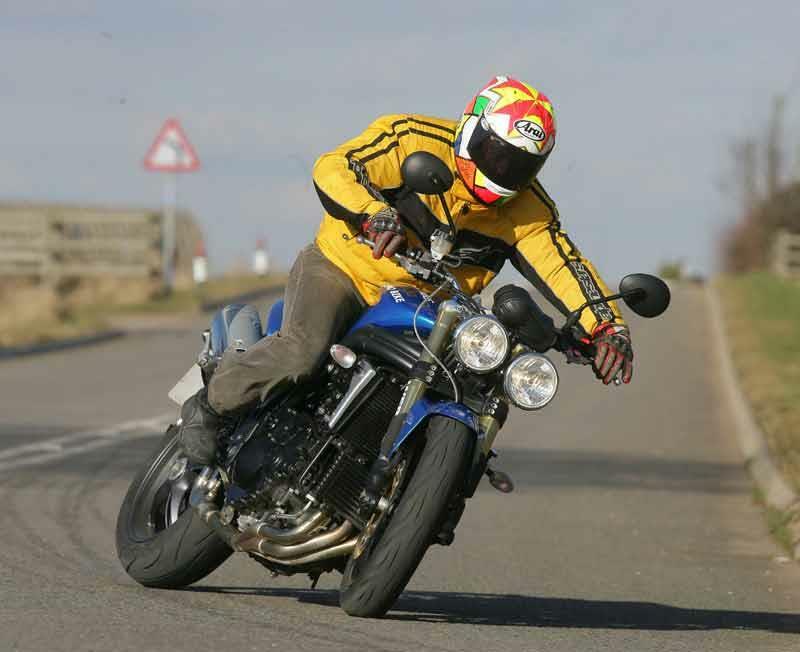 Watch the 2005 video roadtest of the Triumph Speed Triple here. 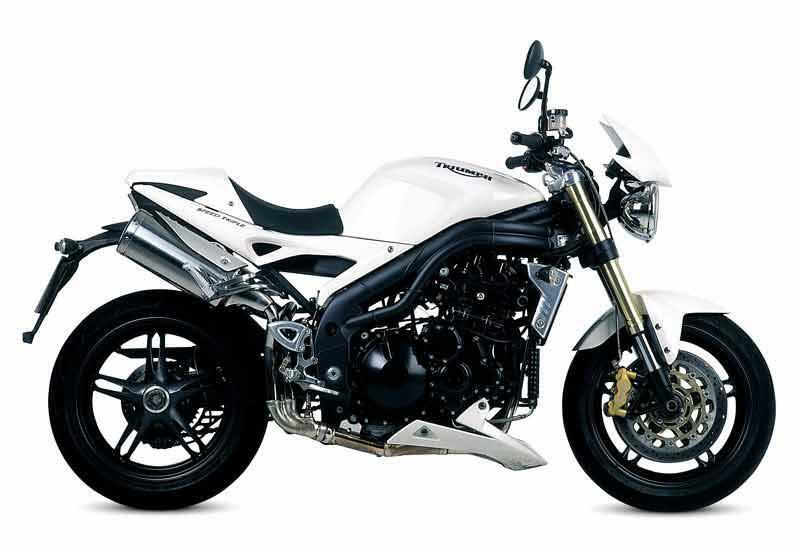 The Triumph Speed Triple 1050 is a motorcycle you need to test ride before you buy it. 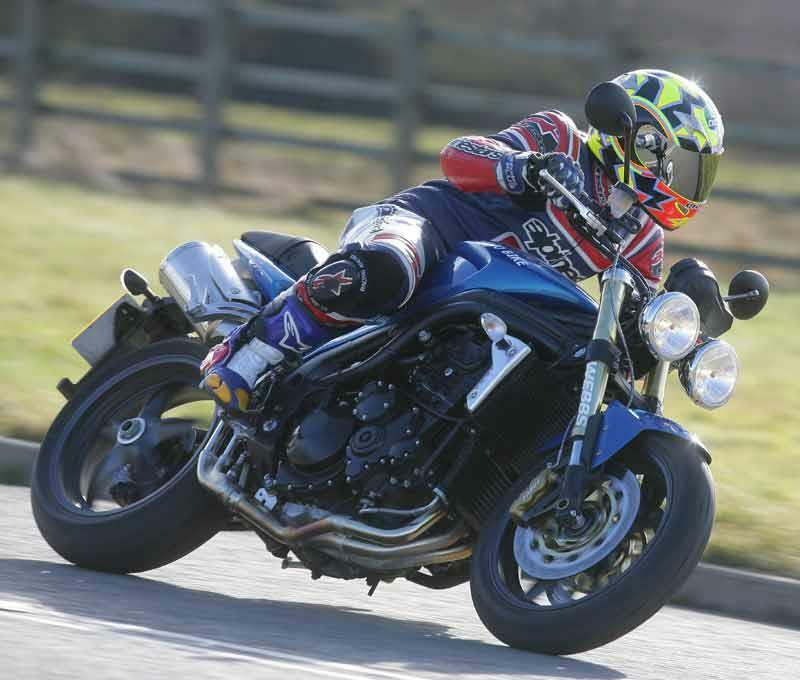 Not everyone likes the slightly lairy handling, which has a suspension set up on the firm side - you could do trackdays on the Triumph Speed Triple 1050 and acquit yourself respectably, but road riding is harder work because of that firmness and precision. It isn't that comfortable on long rides, but if hard charging cornering and braking are your thing then the Triumph Speed Triple 1050 delivers a sporty ride that can cope. Loads of stomp, real kick-sand-in-yer-face power from the 1050cc three cylinder motor, pretty much lifted straight from the brilliant Sprint ST and retuned slightly to make even more gobby amounts of torque. The Triumph Speed Triple 1050 makes serious oomph between 3000-8000rpm and you can just rocket past cars on congested A roads anytime you feel like it. Lovely even power delivery from the fuel injection too. 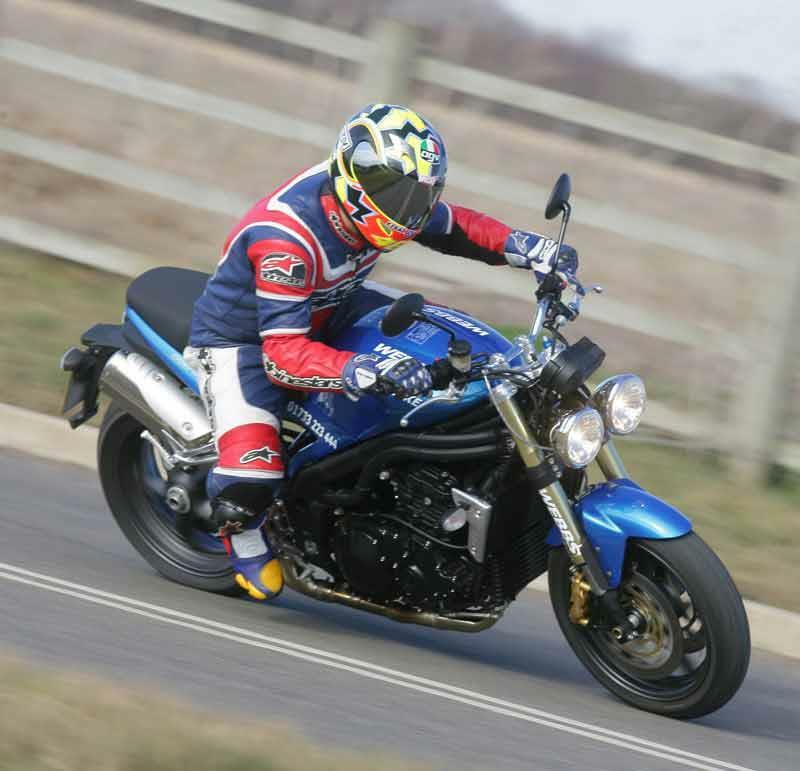 The Triumph Speed Triple 1050's overall build quality is good, but it could be better in places and clumsy details stick out on what is generally a brutally handsome looking motorbike. No worries over the reliability of the Trumpet in the long term, but the exhaust system looks a bit exposed and vulnerable to corrosion. 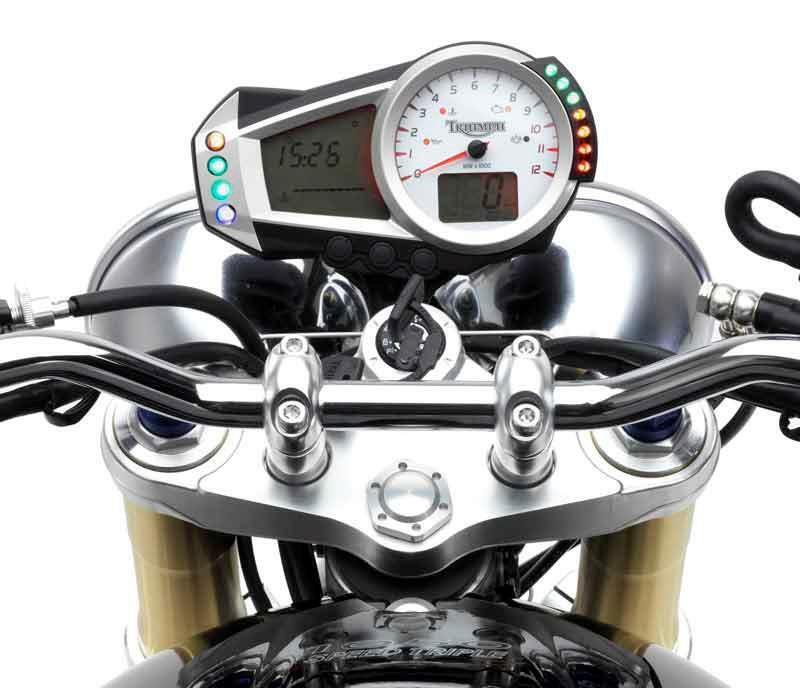 Triumph Speed Triple 1050 is a naked roadster so it's basic. 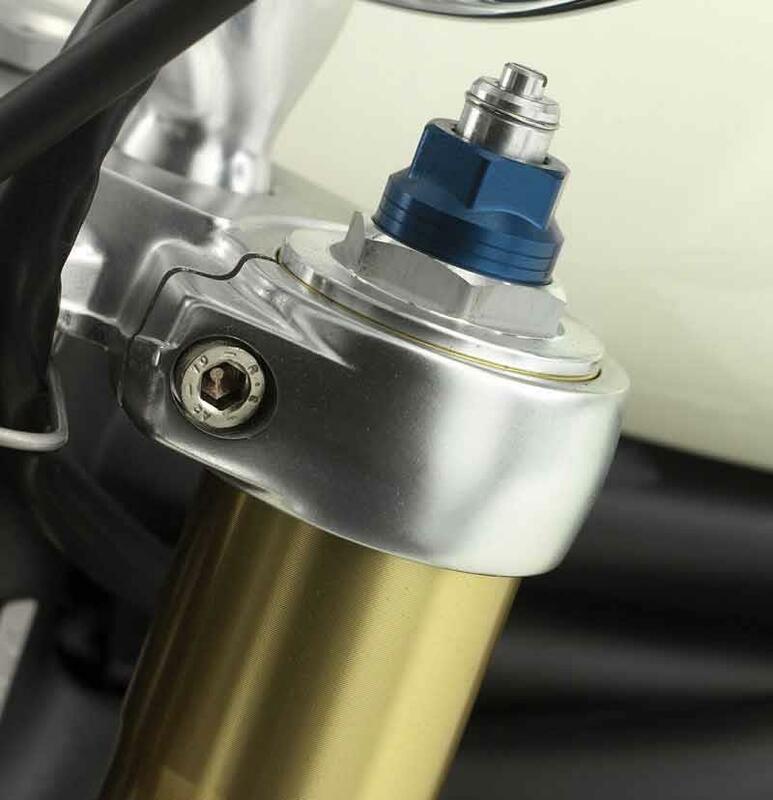 What you can't deny is that the massive brakes, the beefy USD forks and fully adjustable monoshock do the biz on the Triumph Speed Triple 1050, but odd details like the 90s style headlights, or the little indicators, detract from the overall package. 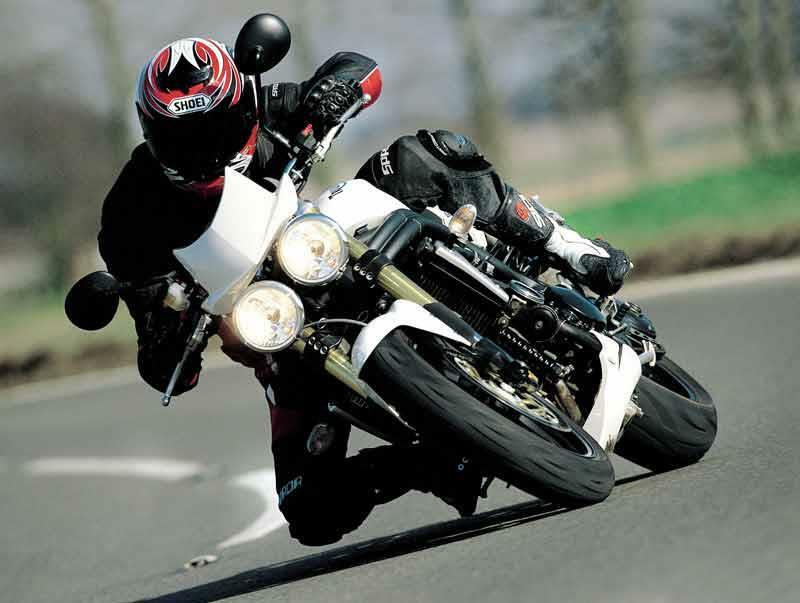 2005: Triumph Speed Triple 1050 launched. 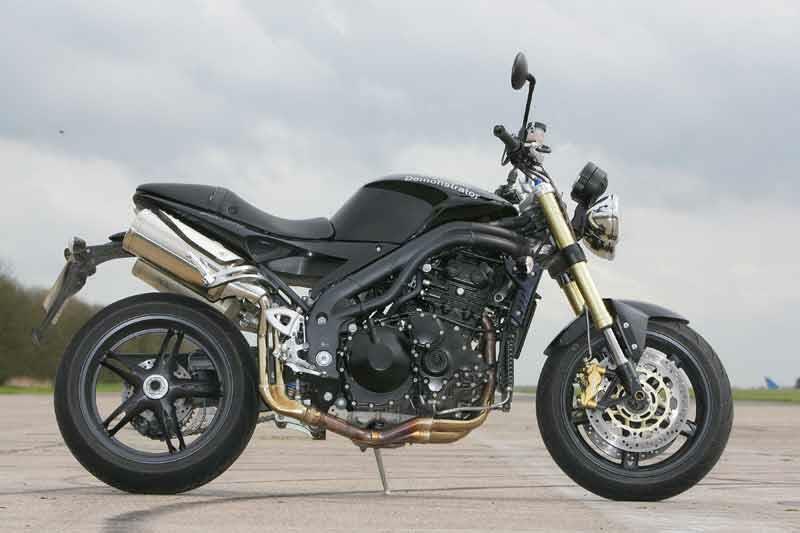 15 owners have reviewed their TRIUMPH SPEED TRIPLE 1050 (2005-2010) and rated it in a number of areas. Read what they have to say and what they like and dislike about the bike below. 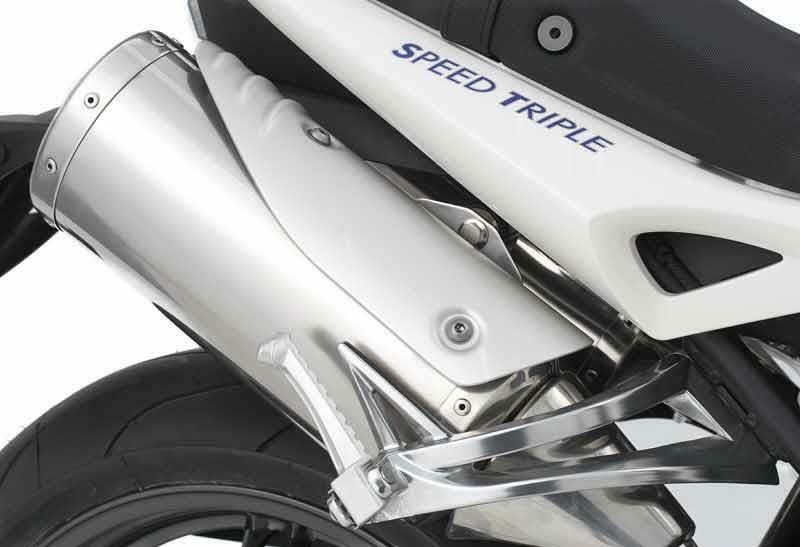 Early 1050 Speed Triples, the good and the bad of it. Would be 5 if it wasn't for those darned electrical issues. Brakes are great when on form. If being hyper critical suspension is a little lacking by modern standards but it takes some pushing before it bites you so not a cause for real concern. I've got mine wound up very stiff so the posterior needs bit of a rest every 100 miles or so. The engine is a real peach. Big fat gobs of low end torque, lovely it is. I've put over 40,000 miles on mine and it's only just beginning to feel a bit worn. Expect it to lose a lot of it's charm if you change the exhaust for a noisy short one though. The Speed Triple seems to like that long, long underseat pipework and a fair chunk of bottom end oomph gets chopped off in exchange for noise liberation and better lines. Far better to fit louder underseat cans and to hell with the looks. I'm afraid it loses out big time in the reliability department mostly thanks to it's charging gremlins. The charging system on the early speed triples is frankly diabolical. The generator will overheat and burn out, the reg rec will die and consequently your battery will do the same. It will leave you stranded, nearly always on a hot day of after a long blast. If you use one of these daily expect to change the complete system every couple of years and reg recs as often as every 6 months. Other niggles are the tank fills with water as soon as it sees rain as the cunning water drain around the fuel cap blocks up often. The needle roller bearings in the rear suspension linkage will seize up every couple of years if you don't grease them regularly (every 6 months is advisable). They are vulnerable to water ingress. Also expect starter motors to die around the 40,000 mile mark (which isn't bad going). Servicing can be cheap as chips if you do it yourself, just get a dealer to do those fiddly valve clearances every 12000 miles. Also every 20,000 or so you will need to get the injectors set and all fuel and air pipework checked for rot and leaks. Expect up to a £500 for major services or nearer a grand if the suspension bearings need doing. I'm a big fan of the engine and riding position. Flyscreen improves looks and does deflect some wind. Fat bars look nice but add nothing. I bought mine for £3000 in 2009 as a cat D cosmetic insurance write off. £400 and a bit of labour later and it was as good as new. If you know what you are looking for the bargains are always to be had privately. Seven year on and still in love! I bought my Speed Triple new in 2008. Since then I've had a great time on this bike. The engine is, in my opinion, perfect for a street machine. The bike possesses gobs of torque, and that wonderful sound stirs the blood in a way that no high-revving boy-racer can. The stock suspension is probably spot on for a typical rider, but as I tip the scales at about 230 lbs. I've upgraded the suspension with an Ohlin's rear shock and GP Racing fork kit. The fork now doesn't bottom under hard breaking and the rear is much more planted and precise. Some will say that the suspension is pretty stiff, but it suits me fine. Only three of five here due to brakes being such a mixed bag. 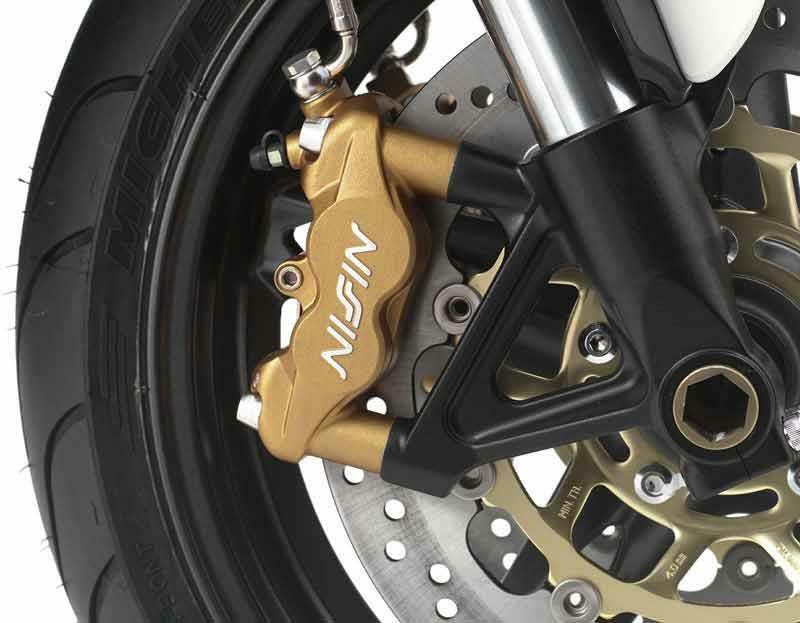 The brakes when new are very good, both in modulation and stopping power. However, the front rotors are substandard and don't hold up well to spirited riding. They warped badly with only a couple thousand miles on them and I quickly replaced them with aftermarket parts which have held up well. Ride quality is as already mentioned. This is a great engine right from the factory, with loads of torque and a power band as flat as a Kansas wheat field. This makes the bike squirt through traffic at will. I wouldn't bother with much tuning as you'll only gain 3-5 hp at best. I've being using Tuneboy to manage the engine and have had it on a dyno and worked over by a professional, but frankly it has resulted in only incremental gains. Yes, there are a few bits that could have been done better; the little side covers that lay just behind the tank are cheap and don't fit as well as you would find on a Japanese bike, and the fuel mileage gauge is horribly optimistic, which seems to be a common trait with Triumphs, at least of this vintage, but otherwise the bike has held up very well to 7 years of riding. My service costs may be lower than most as I do nearly all of my own maintenance. The occasional set of tires and a new filter and oil pretty much do it. I wish the fuel mileage was a bit better than the 35 MPG that I typically see. Best bit is the engine, hands down! As for other equipment, the Ohlin's shock and fork kit were a marked improvement and required for a rider of my size to get the most out of this bike. I have also fitted an Arrow 3-1 exhaust. This is likely illegal in most of Europe, but in my home state it's fine. I just remember to keep the RPMs low when in residential areas. Having said that, the only thing you gain is the look and sound of a race exhaust. If you are looking for best torque, stick with the stock exhaust, or maybe fit the Arrow cat-back system. My dealer was Cascade Moto Sports in Beaverton, OR, USA. The price, with exhaust, was about $12,500.00 in 2008. They are a great dealer and I would have no qualms about buying from them again. I liked the Triple. It has all the must have bits on, and looks like it would bully the other bikes in the garage! Obviously we know it performs well, and Triumph have done a great job of designing a solid common sense engine to work on too. My only gripes were the skinny hand grips as standard, and being so cramped in the leg for a naked (though I am 6'1" and a little lanky). Other than that, if you like it, buy it! 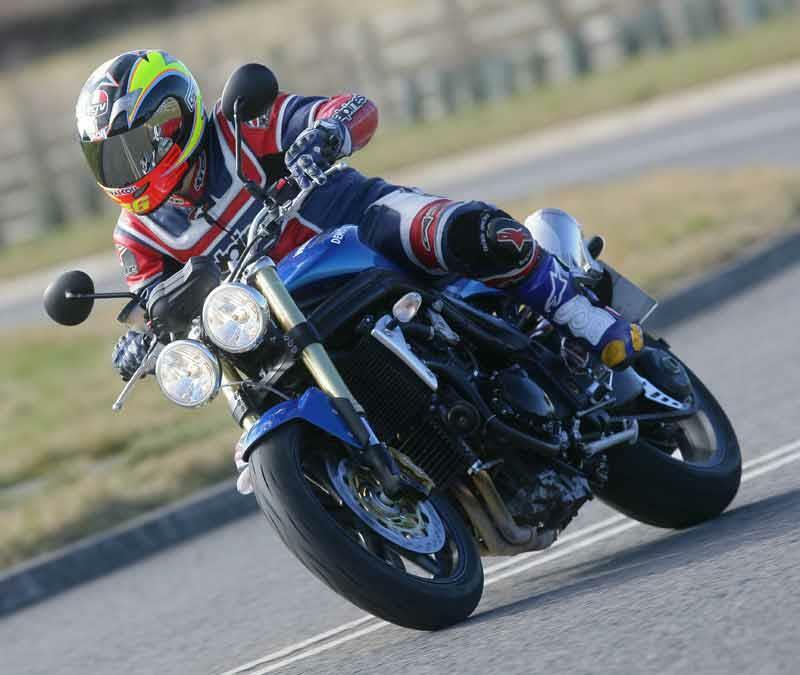 Triumph really are making some of the best quality bikes available at the moment. I have had 3 in the last couple of years, all very good, in fact I would go as far to say the best bikes I have ridden to date! I've been given one of these as a loan bike after the garage crashed my Street Triple and it's an amazing machine. The power, handling and looks (despite the metalic green paint job!) are really impressive. Bit heavy and not as nimble as the Street Triple, so it becomes a bit hard going after a while on the really winding roads and in rush hour traffic, but on the open roads with sweeping bends, it's awesome. The power delivery is aggresive but smooth and the torque is neverending. I opened it up a bit in 1st (not full throttle) while pulling away and I ended up on one wheel, despite leaning forward over the handle bars. Def need to be careful in the first couple of gears! I do prefer my Street Triple, but that's mainly because I use it to commute and do a lot of miles on very windy roads, which it eats up. The only downside is that it was noticably very thristy compared to the Street Triple, but it is a big engine, so to be expected. I got 31mpg over the weekend on a pretty sedate ride. I'd have expected at least 50mpg out of the smaller Street Triple. Great bike though, and I may consider one in a few years if I can afford to have another bike too just for commuting. I have had my Triple 15th anniversary for 6mths, covered about 2k, I am affraid to say not that impressed, I think I must have a friday afternoon one,It stops ok, rides ok, excellerates ok, but as you can tell it seems ok, but I must admit it is a looker after I changed the pipes, added a few bits to make it my own, but a least I don't have to keep shutting the throttle like I did on the Aprilia Tuono or the Yam FZ1. I think it may need to go to the shop as mine tops out at 125mph.Its ok as long as I stay on the small roads you would never know. Wow, This is one hell of a good looking bike, that beautiful big back tyre and the gorgeous black paintjob, its probably one of best looking Streetfighter around. 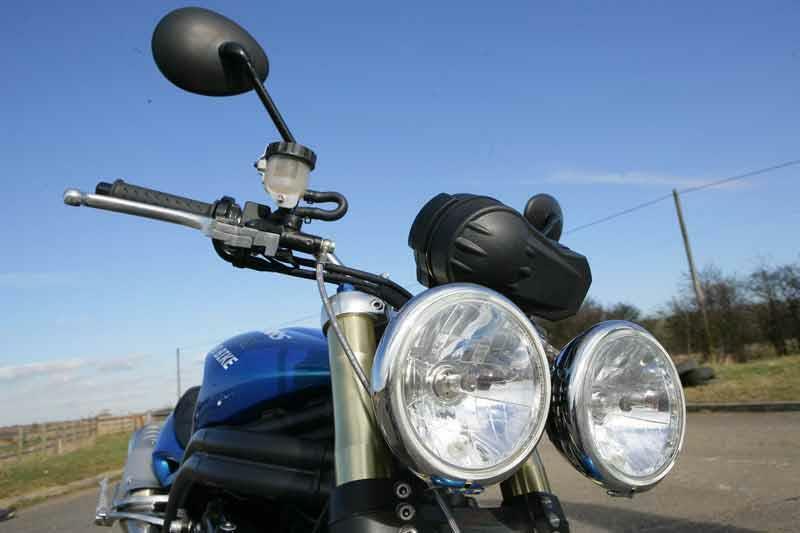 Triumph have kept their traditional look twin headlight and it just looks much better than the rest! If you think it looks good from a far, wait till you get on it and start her up !,, and prepare to dribble like a 6 week old baby. Unlike anything else, well this bike makes such a beautiful sound it constantly takes my breathe away. Mine has a full arrow 3-1 Racing exhaust system. But I have heard a standard one as well, and you simply cant get over the noise as you open up the taps, or my favourite bit, the burble and pops you get when you come off the throttle suddenly. Sounds like a Roaring Lion after having just eaten some TNT. The biggest shock though is the performance, this is a Streetfighter, it's pretty upright and really comfortable, so it comes as a complete surprise when you open the throttle and find yourself in some sort of alternate reality as you have ripped a whole in the [Space Time continuum] Yes it is that quick and it's the surprise that gets you, I am used to a Streetfighter being slightly detuned to allow for smoother riding, not here, this Machine is scarily fast, and because of the engine set up and the fact its a triple, it can apply that shock factor at all times! 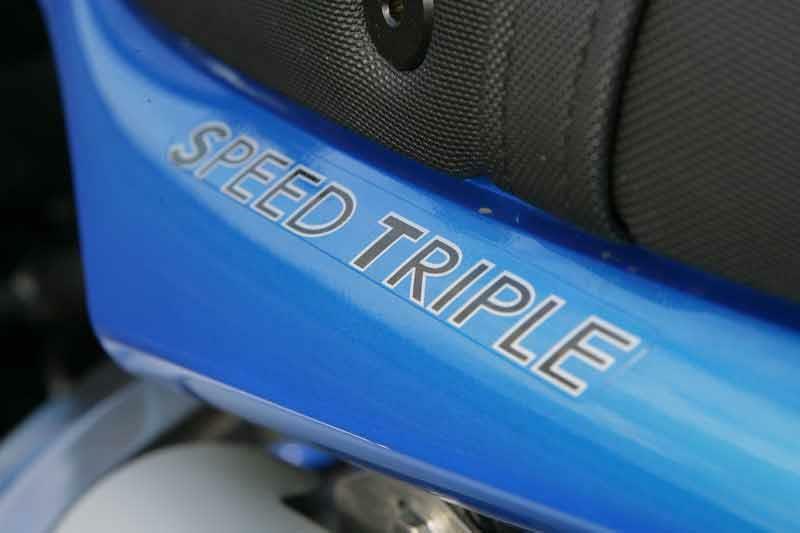 Speed triple is a "Hand Grenade bike" which means you pull the throttle and just kind of hold on for your dear life! Luckily the handling and suspension can handle it, and the brakes are so good that even if you do get surprised by the power, you can easily take off the speed before you kill yourself or find the road running out. Every time you get on this bike your guaranteed a thrill, its definitely not for the novice rider, but for a decent rider who wants to be able to stay up with the big boys on the Superbikes but still retain that Streetfighter style and image, then this is the bike for you. Go take a test ride. I have had quite a few Jap bikes and wanted a change so purchased a 955i Daytona 2 years ago. I wasn’t looking to buy a triumph ( I wanted Italian) Found that the Daytona was a cracking bike for the money. This year I looked into getting a 1050 speed triple but thought that it can’t be that far off the Daytona, how wrong, this bike raises the bench even higher, after the test ride I had to have one. I now look for excuses to ride it. Its like you have just passed your test and got your first big bike. May it continue. I have had my 1050 speed Triple for over 2 and a half years. I went from a 125cc to the triple with no problems. It is a really easy bike to handle. The triple is a good all rounder, it has been around europe twice, track days, commuting to work, high speed cruising in germany and been through a desert and has not missed a beat. The only problems with it i think are 1.the exhausts they look fantasic but they have melted rucksacks, hand bags, boots(pillon),helmets(badly placed when shopping) and coats. 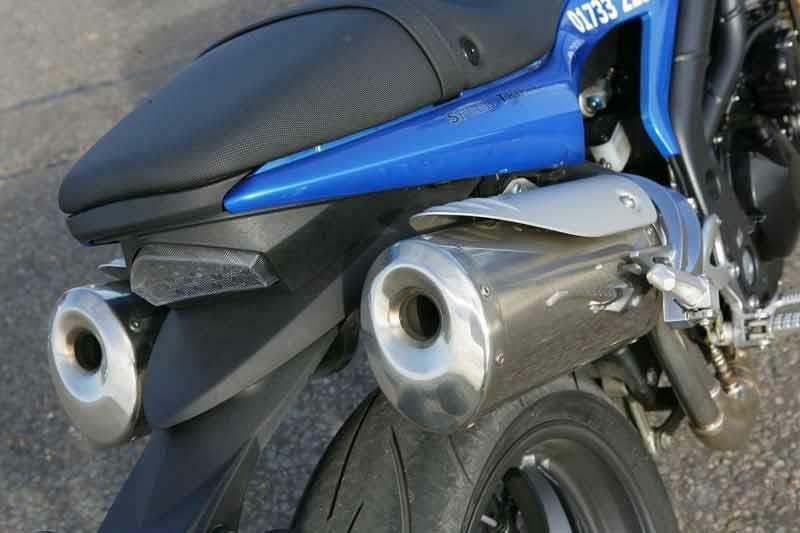 plus they stop you from putting panniers on but you can buy after market lower exhausts. 2. After 12,000 miles i had to get a new clutch. 3. Services(every 6'000 miles) can be expensive. and 4. I think it can feel a bit top heavy. But it is a fantastic bike and i'm glad i chose it for my first big bike. The problem i have now is what ever bike i get next has got some big shoes to fill. Had my 1050 Speed Triple for 2 and a half years. After eventually getting working pistons fitted in the front brakes ( thank fook ). It's brilliant, the best ROAD engine you could want, handles pretty well and if only the Brembo brakes of the 2008 model were fitted to it originally. But Triumph build quality is getting worse. I have had one new wheel, rear footpeg hangers,front brake pistons and I know plenty of Triumph owners with many an issue, one with a Speedmaster, only 4 months old. Come on Triumph, get it together cos you make great products and go and ruin it with a cheep finnish. 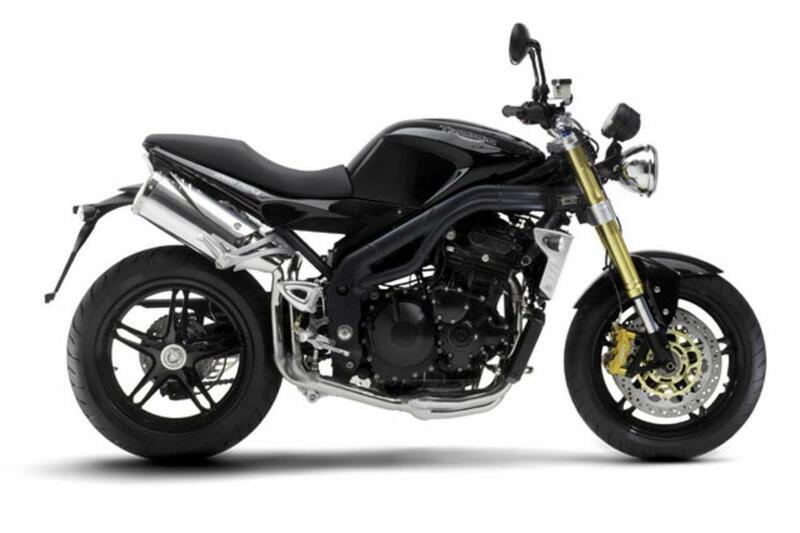 I love to say to people I ride a Triumph,and am proud to buy Brittish.But this is my second Speed Triple and my heart say's by another Triumph. My head say's up your's Triumph, give me a call if you are going to sort out the quality.Mr KTM is the only other contender on my list, and we will have to see what the new VENOM will be like when it's launched by the end of the year. Had the bike for 7 months now and have had nothing but the best riding of my whole 16 years on bikes. It's fast, handles superbly with impecable road manners and it's easy to out ride sports bikes. I find it more comfortable than the GS I had previously even though I have arthritis in my hips and I have found a great luggage system from Ventura that lets me go where I want without having to sacrifice comfort at my destination. Strengths: All round great bike. Weaknesses: Triumph servicing and parts costs are bloody steep but once the warranty is out they can stick it up their arse. I've owned one for three years and what a great bike forget sports bikes this will stay with them on any twisty and a good rider will leave most sports bikes standing . Strengths: Awesome engine for drive out of corners and rock steady suspension even two up when set up right. Weaknesses: Gear box a bit notchy and sometimes a bit stiff.